The Umba River deposit is 70 km northwest of the seaport of Tanga. Corundum occurs in veins of corundum anorthosites within a serpentinite massif in the core of a brachyanticlinal fold. The massif is about 2 km long and 0.5 to 1 km wide. Corundum crystals have a hexagonal tabular shape without dipyramidal faces (Hanni, 1987). 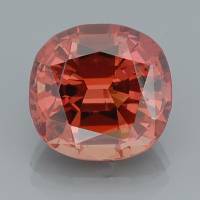 Colour is often zoned, with darker cores in the rubies, and with darker margins in the sapphires. Bluish green, yellow-green, brownish yellow, reddish orange (padparascha type), and violet-red tones are characteristic of the corundums. 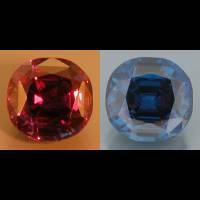 Some violet (vanadium-bearing) sapphires exhibit the alexandrite effect. The refractive index is 1.761 - 1.778; and the density is 3.96 - 4.01 g/cm³. Crystals contain numerous mineral inclusions.